Frankie is ready for new adventures! 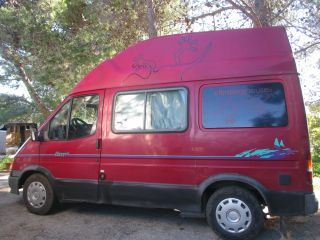 (5) 2 Rome You rent a delightful and beautiful pure camper. Along 5.41 can be parked everywhere. Free admission in every city. Green color. 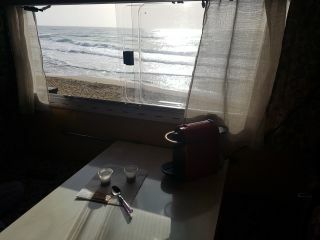 (3) 4 Limana Vintage and stylish camper, great for weekend trips. Also available for longer periods. 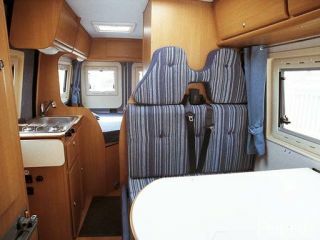 Equipped with sink with running water, two burners and 220v fridge. Two single and a half beds. External awning. Italy, the land of pizza, pasta and good wine... The best way to discover this all is through RV rental. 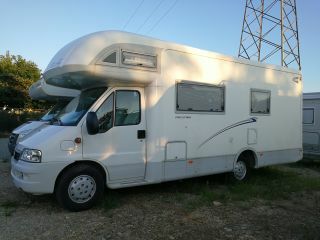 Luckily Goboony is here to give you the best experience of RV rental in Italy! 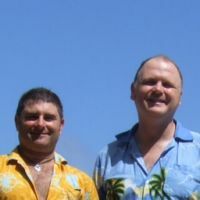 Goboony is the number one RV and campervan sharing platform in Europe, bringing private owners of RV’s and campervans together with travellers. 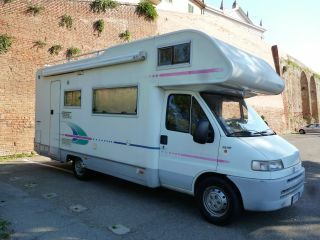 On this page you’ll find all motorhomes for hire in Italy. All RV’s are checked and safe, and the owners ensure good care for their vehicles. 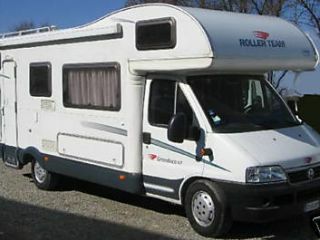 Compared to RV’s that you can rent through companies, the RV’s that you can rent through Goboony are quite cheap. Have a look at this page to find the RV of your dreams. Make a booking request and get in contact with the private owner. They can give you all information you need from the best destinations to parking tips. Goboony is there to handle all the formal stuff like contracts and payments. 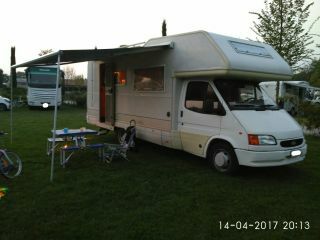 The owner of the RV and our team will do everything to give you the best experience of RV rental in Italy possible. 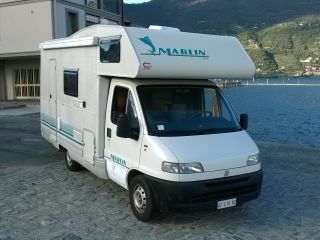 We had a fantastic four-week holiday in the "Mighty Marlin". Ludovico the owner was delightful to deal with. 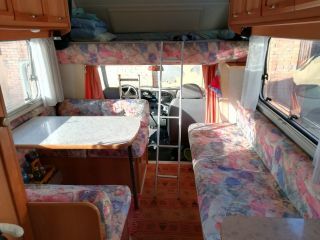 The motorhome layout was fantastic, with plenty of space and height (I am tall and there was plenty of headroom). The in-built ceiling fan kept us cool on hot nights, and the in-built heater kept us warm when we went up to the alps. 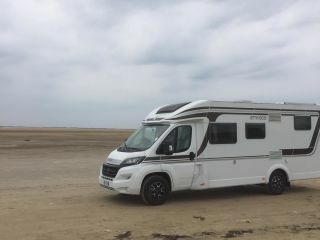 Everything in the motorhome worked well, and it was a pleasure to drive and very economical. 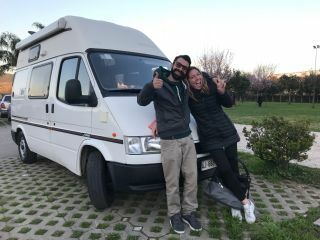 We would happily rent this motorhome again if we were back in Italy, and would highly recommend Ludovico and his motorhome. È stata un'esperienza incredibile!! 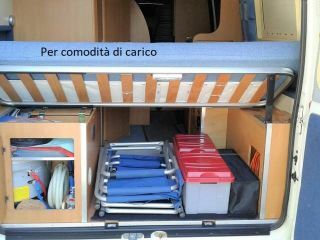 Era la nostra prima volta in un camper e non possiamo essere più felici. 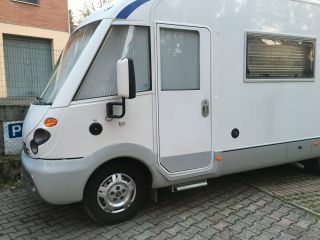 Il camper di Diego è perfetto oltre ad essere molto ben curato. È stato super gentile con noi, aiutandoci in ogni momento con i dettagli che non conoscevamo. Altamente raccomandato!!!! Good, old motorhome. 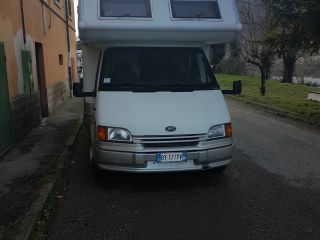 Big plus in south if Italy - you can drive it and park it in old towns. You can't do it so simple with normal camper, streets isn't wide enough. 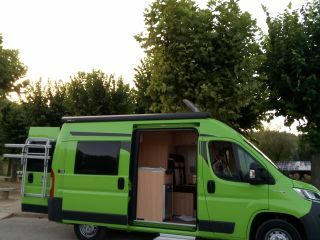 Giovanni gave us a good experience in Italy by renting his campervan. Plus, he gave us some spots to visit and to sleep. 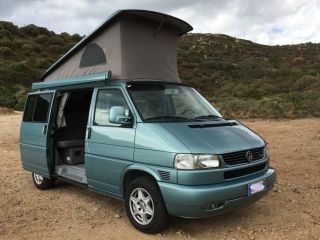 I definitly recommand Giovanni's vehicules and tips if you want to spend a good trip in Italy. Buenas , Somos una pareja y un bebe que hemos estado una semana por el valle de Aosta. Marco y ersilia encantadores, mejor imposible. nos facilitaron todo para este viaje que nos planteaba muchas dudas por el frio ya que queríamos ir a zonas de montaña frias con la niña. La autocaravana funciona muy bien, muy comoda. calefaccion perfecta, y frigorifico y cocina funcionaba perfectamente. Menaje de cocina y ropa de cama completa. 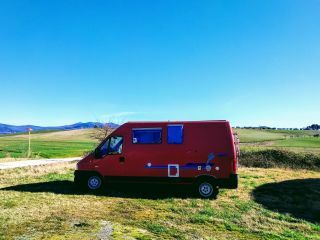 En resumen una autocaravana estupenda para viajar por italia. es un placer encontrar a gente tan buena que te ayude a viajar. Volveremos a alquilarla seguro. un saludo J.mari , noelia y abril. 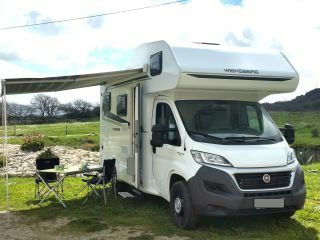 Why rent an RV in Italy? 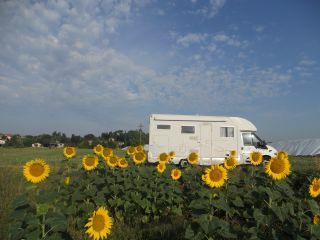 There are plenty of reasons to hire an RV in Italy. One of the most amazing things is how an RV gives you all the freedom to travel. You do not need train tickets or a hotel reservation, you can simply go with the flow. Especially in Italy this is so much fun. 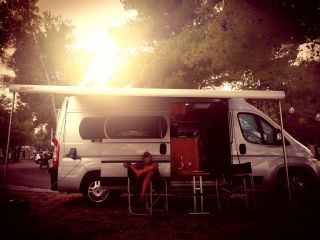 Through RV rental you can really experience the ultimate Italian La Dolce Vita. Just follow your feeling, cruise wherever the roads take you and enjoy everything Italy has to offer. 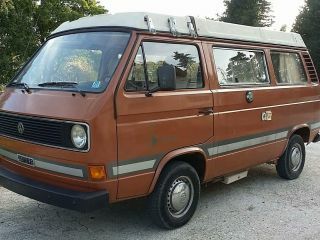 Also nice to know, in Italy you can find many vintage VW campervans to hire- photo ready! Where to go in the Italy? Italy looks like a boot, and every part of the boot has its own specialties. 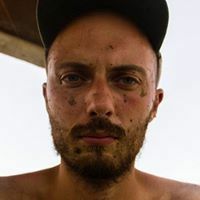 The wavy hills in Tuscany with the typical houses and cypresses, the beautiful rough Dolomites, Garda Lake, the Amalfi coast, the beautiful villages of Cinque Terre and so much more. Italy also has amazing cities. Who wouldn’t want to stroll through the streets of Rome, go shopping in Milan, take a photo with the tower of Pisa and get lost in alleys of Venice? 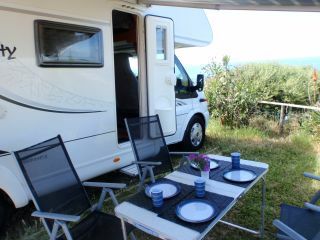 You can also visit Sicily and Sardinia in an RV. 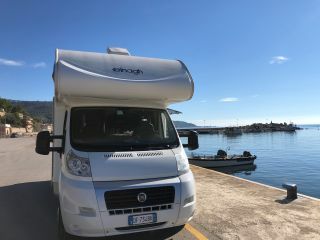 You can rent one on the mainland and go there by boat, but you can also go there and discover Sicily and Sardinia through RV rental over there. The islands are pretty special each in their own way. With a coastline of more than 1,000 km Sicily has much to offer for a vacation full of sun, water sports, swimming and snorkeling. You can also hike the volcano Etna. Sardinia has great nature to offer, you can even find flamingos in the south. Let your inner Julia Roberts out and go to Italy to really take your time with high quality food again. It doesn’t matter where you go, as you’ll find the best food and drinks everywhere. Real cappuccino (remember they only drink it in the morning), thin pizza fresh from the oven (go to Naples for a real pizza Margherita), pasta with the best high quality ingredients, bread dipped in homemade olive oil, tiramisu (probably the reason why they call life sweet) and such good wine that even the look of it in your glass will give you a warm feeling inside. And the best thing is, all the food is pretty cheap.